This looks absolutely delicious. Could you provide pictures the next time you make this of steps 3-5,, (fanning)? I've never made strudel - this looks so delicious. 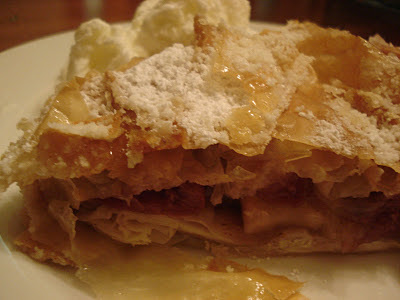 I love Apple Strudel. I never had it mixed with Cherry, I bet it is so good. This looks delicious Charlotte. I've never made studel either and will have to try this recipe. I'm definately a fan of yours too! Oops - I mean stRudel :). Char, this looks amazing...I,ve always wondered how one does that?? Are the apples peeled? Sliced thinly? Diced? Love everything about this site. Yes, pictures would be great!